One of the things I love about vim is the level of support for languages and text formats. If it's not supported by vim out of the box, there's a very good chance are that there are several plugins to choose from that will add the desired support. In this post, I'm going to highlight a few language-agnostic tools that will make your life much easier. The idea is that you will be able to use these tools regardless of which language you're using, but they'll give you many of the features that you would expect from a graphical IDE. I should probably mention that this is my opinion. There are lots of plugins that do similar jobs to those that I'm going to mention, but I'm not interested in making this an exhaustive list; these are my recommendations based on experience, and they may well change as time goes on. Just a quick note: this tutorial assumes that you have a working knowledge of Vim and know how to configure it on at least a basic level (i.e. 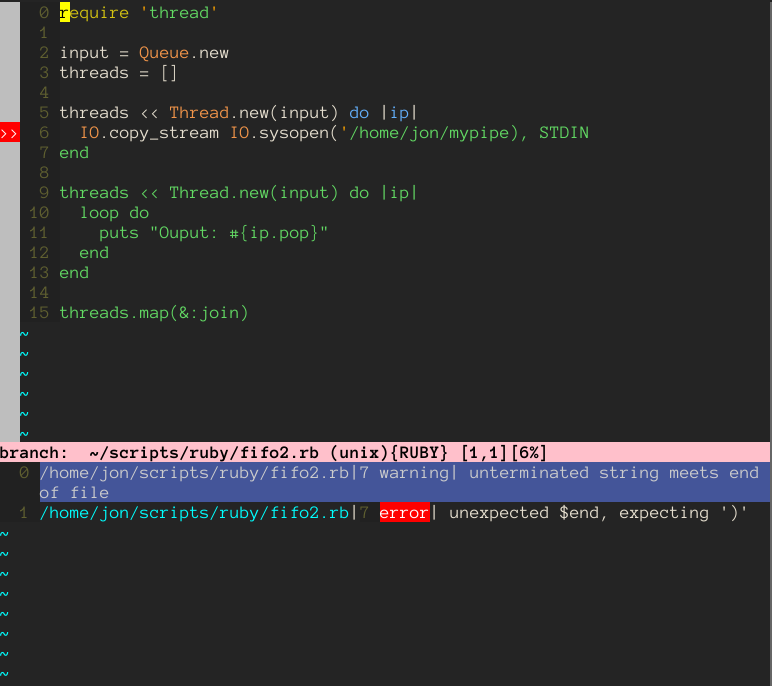 you know where your vimrc file is, and you know how to install vim scripts). It also assumes that you're running at least version 7.0 of Vim. The errors are listed below the buffer in the location list, and signs mark where the error appears in the file. The fact that this covers so many languages, and works so seamlessly, means that I consider this plugin to be practically essential. The nice thing is that it's pretty forgiving: I can misspell the file I'm looking for, but it will often still appear in the results. Plus, it's lightning quick; first time round, it will spend a few seconds caching the list of files, but afterwards it will zip through the list of files as you type. When I'm working on a project I like to change the current working directory in Vim. Therefore, when I run Ctrl-P, I run it from the current working directory so that it only searches the project. However, it has some intelligent features built in so that it will try and work out the project directory - e.g. it can search directories above the current file until it comes across something like a .git folder. It's very customisable, so check out the readme to find out how to best configure it for your setup. For instance, I have different invocations mapped to different key combinations, so I can search through files or open buffers. That command will recursively search all files in directory for "search string" - use :help grep to get more information. It then puts all the results in the quickfix window (:help quickfix), which will allow you to jump backwards and forwards between the occurrences. As you may well know, the grep command is a vim implementation of a very prolific unix tool. I used vim's grep for a while, until I was introduced to Ag.vim. This is a vim plugin for [Ag](https://github.com/ggreer/thesilversearcher), also known as "the silver surfer". It's like ack, which is like grep. Confused? All you need to know is that Ag is very quick, and the vim plugin is a drop-in replacement for vim's grep. It works in the same way as the grep command, without the need for the -rmodifier (as it searches recursively by default). Ag isn't essential, as speed is the main benefit you get over grep. But if you find yourself using the grep command on a regular basis then I'd consider it to be worthy of a place in your vim setup. Modify as desired. You can then hit tab in the middle of typing a word in insert mode, and it will bring up a list of suggestions. Vim can use tag files generated by _ctags _to allow for quick, keyword-based navigation. For instance, placing your cursor over a class name and typing <C-]> will take you to wherever that class is defined. This works well, but managing tag files can be a pain: tag files need to be kept in sync with your code, meaning regular manual updates. Almost all developers will work on more than one project, and managing projects is built in to all graphical IDEs. I've used a couple of project management plugins for Vim in the past, but I felt that they were all overcomplicating the problem. Since Vim is so scriptable, all you need is a way of managing multiple miniature vimrcs for each project that you work on. For instance, one project may require spaces instead of tabs for indentation. Another may have a different set of tag file options. One thing I like to do when I'm working on each project is change to the root directory. Here's an example of one of my sauces. This is why the title of this section is in quotes. It's not really project management, but it's very unobtrusive. It allows you to write pure vimscript, with no magic, which was my aim for the project.